Norma Campbell’s inspirational and life-changing self-help book that provides the insights, tools, and techniques to help readers heal from past and present trauma or loss and become whole again. It provides the advice needed to help those in need of support take great care of themselves, develop satisfying relationships, and so much more. Norma Campbell is a licensed psychotherapist, author, seminar leader, and keynote speaker. Over the past sixteen years she has helped hundreds to heal from severe crisis, trauma, and loss and has a growing reputation for being a therapist who can powerfully transform people’s lives. The techniques she uses in her private practice in Manasquan, New Jersey are now the basis of her latest book, Healing the Human Heart: Tools and Techniques for a Happy Life. These techniques have transformed the lives of hundreds of her patients and many of these techniques come from her own experiences in dealing with trauma and loss. In addition to counseling individuals, couples, and families, she facilitates Women’s Empowerment Groups and has led training seminars for schools as well as groups in her local community, including a consortium for gifted and talented students. Campbell’s therapeutic talents are also evident throughout her book. Campbell is also the author of I Matter: Tools and Techniques For Loving Yourself that teaches readersnot only how to love themselves more, but also how to create a life filled with peace, joy, and happiness. Grief and healing are hard topics to discuss. They are painful and usually those who are going through these challenges are going through them at one of the most difficult times in their lives. They seek comfort, hope, understanding and most importantly, the reassurance that things will someday be okay. They also feel so incredibly alone. They can’t imagine how anyone else could feel this pain, and what often happens is those who are the nearest and dearest to them haven’t and don’t know what to say, so they say nothing. That’s why we would like to introduce you to Norma Campbell. The author of the recently released book, Healing The Human Heart: Tools & Techniques for a Happy Life. As a successful psychotherapist for over 15 years and author of several books including this recent book, Campbell teaches others how to not only survive, but thrive and offers steps to build a better life. She uses her gentle “you can heal” approach to teach from the heart with compassion and understanding. The techniques she discusses in her book helped her to heal from her own trauma and loss having experienced it first hand as a youth with the suicide of her father and subsequent trauma thereafter. She overcame her challenges and rose to become successful, turning her own tragic experiences into a way to help those who need it most. Norma shares those techniques with a refreshing sense of honesty and a sincere interest in helping others overcome their own pain. Norma has counseled hundreds of individuals and families, and led training seminars for schools and groups within her local community, including a consortium for gifted and talented students. This self-help book, Healing The Human Heart: Tools & Techniques for a Happy Life (ISBN #978-1-4675-4084-1) is 270 pages, published in January 2013 and sells for $15.95. We would welcome the opportunity to send you a copy for review. We believe it would be a perfect fit for your audience. Also Norma is available for speaking opportunities and we would love to send you additional information on that. Please contact us at diana@virtualwordpublishing.com or stop by our site at www.normalight.com. Manasquan, NJ (January, 2013) Hope springs to life for many with the release of the highly anticipated book, Healing The Human Heart: Tools & Techniques for a Happy Life (www.normalight.com) by respected psychotherapist, Norma Campbell, MSW, MA. For thousands who suffer through trauma or loss, this self-help book promises to offer a new perspective on healing and a renewed belief in life after loss. But it doesn’t stop there. It addition to its solid advice on dealing with loss and trauma, it also provides tips and recommendations for goal setting, building successful relationships, living a happier, more content life, developing healthy habits and a positive attitude, and so much more. Healing The Human Heart: Tools & Techniques for a Happy Life provides the insight, tools and techniques to guide those who need help through the most difficult process of healing from past and present trauma or loss. The steps outlined in the book are offered with compassion and understanding from a place of personal experience. The end result is a feeling of wholeness, allowing the reader to finally enjoy the peace and lifelong happiness they deserve. Campbell has counseled hundreds of people and has led them back to a place of peace and wholeness. Those experiences are what molded this book. Additionally, Campbell offers the insights and experiences learned from her own personal trauma, including the suicide of her father at a young age and the traumatic aftermath thereafter. The same techniques that helped her recover, Campbell offers in this book with a sincere interest in helping others overcome their own pain. Campbell is also the author of I Matter: Tools and Techniques For Loving Yourself that teaches readers not only how to love themselves more, but also how to create a life filled with peace, joy, and happiness. 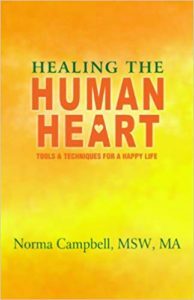 “Norma’s book, Healing the Human Heart, helped me to put the pieces of my emotional puzzle together. This book made the steps to healing so clear and easy to understand. Reading her other book, I Matter, as well as reading her monographs and listening to her Meditation CDs put me at ease in such a way that success was the only possibility. It was almost as if she were right next to me, talking to me, guiding me as I took each step, each exercise she details. Because of these things, and the place of love that she approaches life with, I am completely at peace with myself. I now have the tools and techniques I need to handle any adversity in a healthy and constructive way. Norma guided me on the path to taking back control of my life. She helped me to no longer allow people to negatively affect me and most importantly, to love myself fully. How often do you experience joy? How would your life be different if you experienced joy every day? This seminar will teach you how to eliminate the “joy squashers.” You will also learn how to add an unlimited amount of joy to your life. Are you living a mediocre life where nothing really excites you? Do you have something in your heart that you keep putting off? This seminar will inspire you to take the necessary steps to make your heart’s desires a reality. You have heard how beneficial it is to meditate. During this seminar you will experience the benefits yourself. Enjoy simple, yet powerful meditations that will quickly change your state of mind, decrease your stress, and offer you peace. Most people have experienced some form of depression, so you are not alone. This seminar will teach you seven effective ways to decrease depression. The tools and techniques that you will gain from this seminar can change your life forever. Most of us have experienced some form of anxiety. This seminar will teach you seven effective ways to decrease anxiety so that this no longer consumes your life. This seminar will help you to identify which people in your life drain you and which people add to your life. You will learn how to set boundaries, so that you are no longer drained by anyone. Would you like to create a life of peace and happiness? When you fully develop your intuition, you will be perfectly guided toward creating inner peace, joy, and happiness. This seminar will help you to develop your intuition by using powerful tools and techniques. We are meant to be in our power! This seminar will teach you the necessary tools and techniques that will help you to be fully in your power; therefore, your people-pleasing days will be over and you will begin to live the life of your dreams. You do not want to miss this seminar. When you learn how to love yourself, you will no longer comfort yourself with food. This seminar will teach you how to love and comfort yourself in healthy ways, so that your weight will automatically begin to drop. You will also develop a healthy lifestyle plan that will help to set you up for success. As we all know, life can be difficult. It is your responsibility to make yourself happy. This seminar will help you to discover what makes you truly happy. You will also discover how you sabotage your own happiness. Toward the end of the seminar, you will create a road map that will help you to identify the action steps that you will need to take in order to create a happy life. Some people naturally love to exercise, while others cringe at the thought. If you dread thinking about exercising, then you have not discovered an exercise regimen that works for you. When you were younger, what type of exercise did you enjoy? Did you enjoy riding your bike? How about walking or running? Were you actively involved in sports? Did you enjoy dancing? Add those things back in your life. Once you talk to your doctor about finding an exercise and eating program that works best for you, slowly change your eating and exercise routine. When starting an exercise program, do not set yourself up for failure by pushing yourself too much. This is a big mistake that most people make. You will only get frustrated and talk yourself out of exercising. It will not work. Start off slowly, then gradually increase the amount of time you work out. Be proud of yourself for making the commitment to exercise! When you get in the habit of exercising on a regular basis, you are going to feel much better about yourself and your life. Exercising has the power to make you feel good not only physically but mentally. Exercising will automatically change your state of mind and help you to de-stress. Think of a time when you were feeling down and you decided to go for a walk. By the time you finished your walk, you no doubt felt much better. Exercising offers positive results! Too many people focus on how much they hate exercising. Remember, what we tell ourselves will create our feelings. If you say you “hate” anything, then this will conjure up negative feelings and you will resist doing what you “hate.” As you hold on to your resistance, exercising will become even more difficult. If you change your thinking about exercising, then you no longer have to dread your workouts. Stay focused on how great you will feel after your workout. Why not reward yourself one time a month for working out regularly? This will surely motivate you! Stay positive and make exercising your new healthy habit. The focusing meditation involves focusing on something intently as a way of staying in the present moment and silencing your internal dialogue. You can try this little experiment. Light a candle and stay focused on the flame. When your thoughts wander, go back to focusing on the flame. As you do this, you will be controlling your thoughts and quieting your mind. With the visualization meditation, you are training your mind to focus in a certain direction. This is a great way to de-stress in a very short period of time. Having a heart’s desire is not the same as having goals that you want to work toward. You may have the goal of losing ten pounds so that you can fit into your old clothes. That is simply a goal of yours. Having a heart’s desire has much more meaning. When you accomplish what is in your heart, you will be deeply fulfilled and satisfied. The joy that you experience from this will be worth all your hard work. Life is too short not to take action. None of us knows how long we will be here. Putting off your heart’s desires can lead to having an unfulfilled, empty life, which will only create regrets. You have certain desires for a reason, which is to make them a reality.